SDL diagram is a type of diagram which uses the graphical elements of Specification and Description Language (SDL) for designing the object-oriented diagrams, for modeling state machines in communication, telecommunication, aviation, automotive and medical industries, for creating specifications and descriptions of behavior, data, and inheritance for interactive real-time systems, reactive and distributed systems. SDL diagram is constructed of standard SDL elements (objects) which are designed according to International Telecommunications Union standards. The SDL diagram consists of three building blocks: system definition which defines the major blocks (nodes) of the system such as clients and servers, block charts which show the details and process diagram which show the processing steps in each block. Arrows connect the objects and show the flow of control. The Start object shows beginning of the diagram. Drawing the diagrams we try to find in help the powerful software and now we have the ConceptDraw DIAGRAM The ability easily create the SDL diagrams is made possible thanks to unique Specification and Description Language (SDL) Solution from the Industrial Engineering Area of ConceptDraw Solution Park. 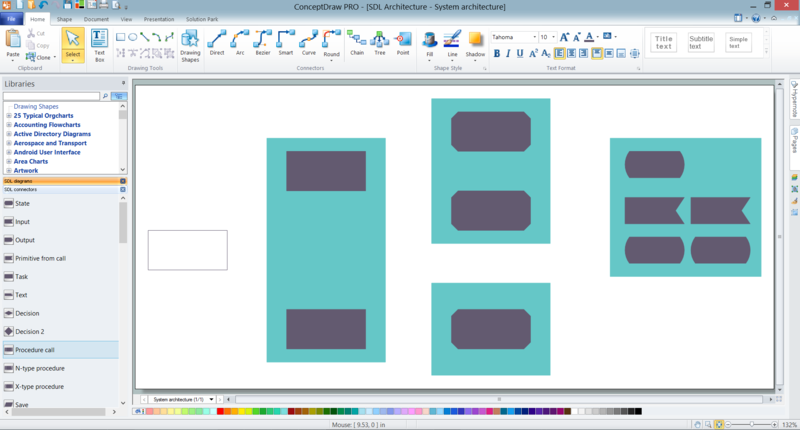 This solution extends ConceptDraw DIAGRAM with 2 libraries - SDL Connectors and SDL Diagrams that contain 71 predesigned SDL flowchart symbols. 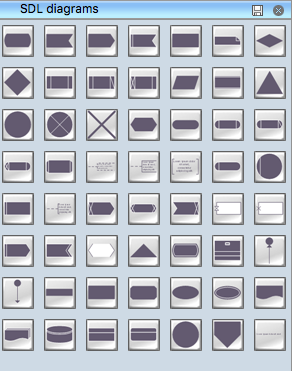 Turn attention for this enormous collection of predesigned vector objects which let design the SDL diagram of any complexity and degree of detailing in mere minutes. Try design your own SDL diagram in ConceptDraw DIAGRAM and make sure that is very easy! With powerful drawing tools of ConceptDraw DIAGRAM you don't need to be an artist, you can concentrate on your work and simply drag and use ready objects developed for you by professional designers. 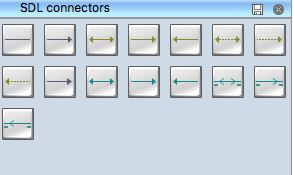 connect the diagram objects using the connectors from the SDL Connectors library and add to text to connectors the same way you add text to objects, if needed. Each SDL diagram designed in ConceptDraw DIAGRAM can be then easy printed to share with colleagues, send via e-mail directly from the program, exported to various formats, including PPT, PDF, MS Visio, HTML, and many other popular graphic formats. Owing to the Specification and Description Language (SDL) solution and its powerful tools, the ConceptDraw DIAGRAM diagramming and vector drawing software is the best for easy drawing the SDL Diagrams to represent telecommunication systems, automotive systems, remote control systems, railway control systems, robotic systems, and more other. 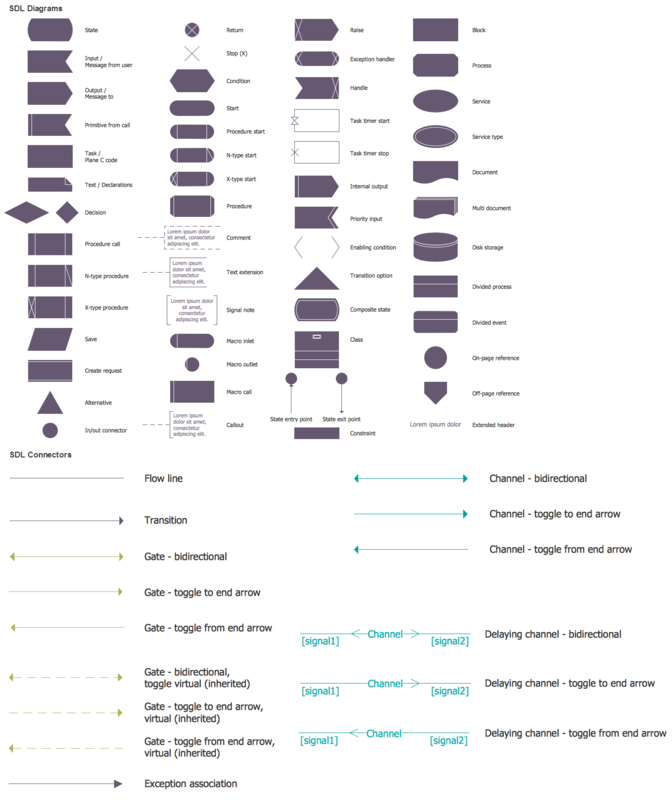 This sample was created in ConceptDraw DIAGRAM v12 diagramming and vector drawing software using the Flowcharts solution from the What is a Diagram area of ConceptDraw Solution Park. This sample shows the Flowchart of the printing the elements of the binary search tree. They are printed in the order from lowest to greatest. On this diagram you can see the rectangles that represent the steps and decision points that are represented as diamonds with questions. It is necessary to make the decision that will determine the next step. ConceptDraw DIAGRAM v12 diagramming and vector drawing software extended with Specification and Description Language (SDL) Solution from the Engineering Area of ConceptDraw Solution Park provides powerful drawing tools for quick and easy creating well-designed FSM diagrams. To visualize the relationships between subsets of the universal set you can use Venn diagrams. To construct one, you should divide the plane into a number of cells using n figures. Each figure in the chart represents a single set of, and n is the number of represented sets. Splitting is done in a way that there is one and only one cell for any set of these figures, the points of which belong to all the figures from the set and do not belong to others. The plane on which the figures are represented, is the universal set U. Thus, the point which does not belong to any of the figures, belongs only to U. A qualifying symbol is graphics or text added to the basic outline of a device’s logic symbol to describe the physical or logical characteristics of the device. 26 libraries of the Electrical Engineering Solution of ConceptDraw DIAGRAM v12 make your electrical diagramming simple, efficient, and effective. You can simply and quickly drop the ready-to-use objects from libraries into your document to create the electrical diagram.